Director – Robert Young, Teleplay – Clive Exton & Chris Harrald, Format – Nick Willing, Based on the Short Stories The New Accelerator, The Queer Story of Brownlow’s Newspaper, The Crystal Egg, The Remarkable Case of Davidson’s Eyes, The Truth About Pyecraft and The Stolen Bacillus by H.G. Wells, Producers – Dyson Lovell & Nick Willing, Photography – John McGlashan, Music – Stanislas Syrewicz, Visual Effects – Men From Mars, Makeup Design – Cherry West, Makeup Effects – Millennium FX Ltd (Supervisor – Neil Gorton), Production Design – Maurice Cain. Production Company – Hallmark Entertainment. In the 1940s, journalist Ellen McGillivray goes to interview the aging H.G. Wells. He tells her stories of back in 1893 when he was a novice writer accompanied by teacher Jane Robbins whom he later married. As Wells recounts several stories not widely known to the rest of the world, it becomes apparent to him that Ellen is not the reporter she claims but from a covert government agency. The New Accelerator:- Jane took Wells to meet the eccentric Professor Gibberne at Imperial College. During a lecture, Gibberne was startled when his demonstration caused a blast in the hall and the spectroscope to disappear. 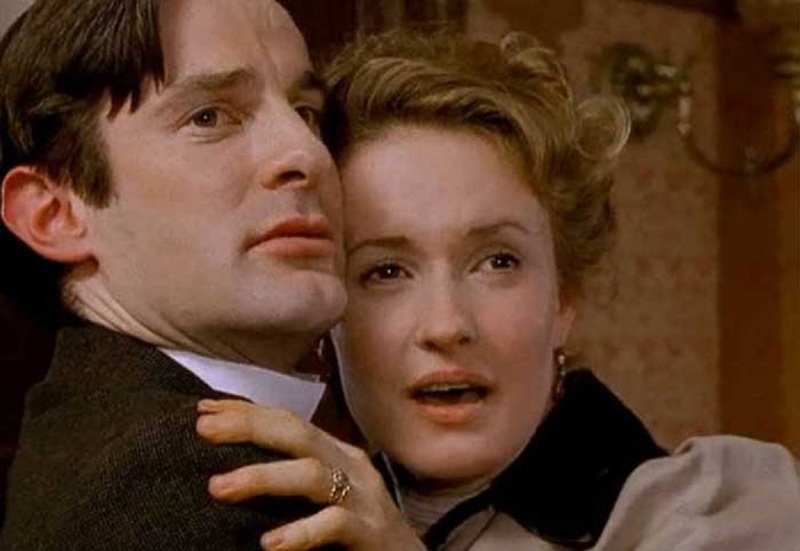 Puzzling over what happened, Wells discovered that fellow academic, Jane’s suitor Mark Radcliffe, had developed a serum that can slow the taker’s perception of time to a standstill. Brownlow’s Newspaper:- Arthur Brownlow, an electrician on the London Underground, received an electrical shock on the job. He came around with a sense of deja vu and able to predict things before they happened. He was also in possession of a newspaper that gave the winning results at the horse track. Wells and Jane became involved as Brownlow attempted to change things that were about to happen – with unforeseen results. The Crystal Egg:- A derelict discovered a strange crystal egg in the aftermath of a meteorite impact and sold it to antique dealer William Cave and his wife Rosa. Wells became curious when it was discovered that the egg first produced light and then showed scenes of insect creatures on another world. As the creatures tried to emerge through, Wells deduced that the egg opened up a portal to Mars. The Remarkable Case of Davidson’s Eyes:- After an experiment at the college, the dean’s nephew Sidney Davidson was dragged away and committed to the madhouse, unable to see and ranting nonsensically about being on an island. It became apparent to Wells that the radio coils used in the experiment were twinned to a set aboard the HMS Fulmar and that Davidson’s vision had become displaced to an island after the ship had been wrecked. The Truth About Pyecraft:- Albert Pyecraft, a friend from Well’s club, was a brilliant mathematician who held a lowly teaching job because he was extremely overweight. Pyecraft pined after Violet, a waitress at the club. Pyecraft’s friend Mark Pattinson told of a mysterious apothecary shop that had sold a miracle cure for his baldness. Pyecraft went to the shop, seeking a cure for his obesity. He was warned to be sure exactly what he asked for. When Wells went to visit Pyecraft, he found that Pyecraft’s wish had resulted in him becoming weightless and floating around the room. The Stolen Bacillus:- Now married, Wells and Jane were frustrated by Thomas Keating, a fan of Wells’s work who had come to stay and foiled their every effort to be rid of him by flattering Wells. 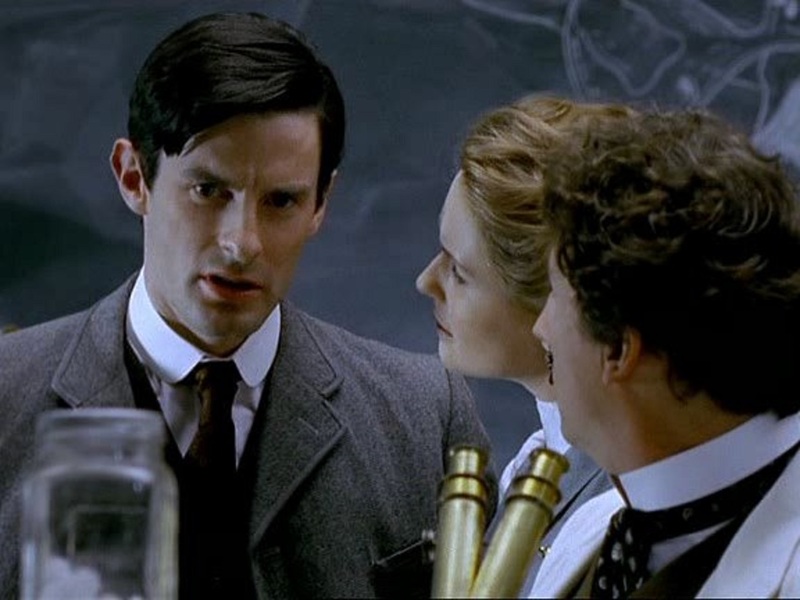 Wells took Keating to meet Professor Gibberne who showed them his collection of bacilli. Gibberne was then shocked to find that one of the flasks had been stolen. It was determined that Keating was the culprit but Wells was unable to prevent him from throwing the contents of the flask in the reservoir. It was then discovered that the bacillus had the effect of forcing people to tell the truth. As Wells and Jane watched, this had socially devastating consequences. The Infinite Worlds of H.G. Wells is a tv mini-series from Hallmark Entertainment who became the producer of a great many television adaptations of classic works of literature, family entertainment and historical stories, as well as a good number of ventures into genre material. (See below for listing of these). The mini-series appears to have been made in Britain with an all-British crew. While not many involved have gone onto anything else, the most interesting name on the credits is that of Nick Willing who became one of Hallmark and their successor RHI’s premiere directors with the likes of Alice in Wonderland (1999), Jason and the Argonauts (2000), Tin Man (2007), Alice (2009) and Neverland (2011), as well as other works like the films Photographing Fairies (1997), Doctor Sleep (2002), The River King (2005) and Altar (2014) – although here he is only credited as a producer and the mini-series’ concept creator. The director is Robert Young, a British tv director who is known for one cult film – Hammer’s Vampire Circus (1972). H.G. Wells’ grandson Dr Martin Wells, a distinguished marine biologist, is also credited as a co-producer. It is possible that the inspiration for The Infinite Worlds of H.G. Wells was the recent tv series The Secret Adventures of Jules Verne (2000), which was similarly developed out around the notion that the young Jules Verne was engaged in a series of fanciful weekly adventures that became the basis for his works of science-fiction. By analogous token, The Infinite Worlds of H.G. Wells is drawn out around the premise that during his younger days H.G. Wells had a number of encounters with fantastical inventions and happenings. This gives the mini-series the opportunity to adapt six lesser known Wells stories – The Stolen Bacillus (1894), The Remarkable Case of Davidson’s Eyes (1895), The Crystal Egg (1897), The New Accelerator (1901), The Truth About Pyecraft (1903) and The Queer Story of Brownlow’s Newspaper (1932). These have been substantially rewritten in many ways, in particular to allow Wells (Tom Ward) and his sidekick/romance Katy Carmichael to become the lead characters. While each of these have been made as one-hour episodes with the wraparound of the elderly Wells telling his story to journalist Eve Best, the mini-series was shown in three two-hour parts in most areas. (You get the impression from this that the original intention was to make The Infinite Worlds of H.G. Wells as an ongoing series but that interest dried up after the six episodes). There was a further British-made mini-series of four episodes adapted from Wells stories with The Nightmare Worlds of H.G. Wells (2016), although that is unrelated to this. The first story The New Accelerator reminds considerably of the Star Trek episode Wink of an Eye (1968). This is a good solid science-fiction story. In fact, the original Wells story simply consists of Professor Gibberne (rather than Mark Radcliffe) demonstrating the New Accelerator to the narrator and they observing the effects of time slowed down after taking it. By contrast, the episode sets up a strange mystery – the blast in the lecture hall, the door ripped off its hinges but nothing else affected, the burnt cricket ball impacted through the clocktower, and then brings it together in a dazzling explanation about time being stilled via sped-up metabolism and the problems of built-up momentum. There is a sense of eeriness in the scenes with Tom Ward and Nicholas Rowe walking through a university that has been stilled in motion. Here the mini-series achieves particularly well. Brownlow’s Newspaper is notedly missing the full title of Wells’s story The Queer Story of Brownlow’s Newspaper no doubt due to the fact that the term ‘queer’ has quite different connotations today than it did for Wells (today it is a sometimes derogatory term for the gay community; in 1932, it simply meant ‘strange’ or ‘peculiar’). This is another intelligent episode, even if it throws out almost all semblance to the story. The story is simply about a man who obtains a newspaper from 1971, forty years in the future, and describes the social changes and politics of the era. On screen, the story becomes a variant on the newspaper from the future premise of works like It Happened Tomorrow (1944), tv’s Early Edition (1996-2000) and the Thai Who is Running? (1997). There is nothing in the story, for instance, about affecting events from a few days ahead in Brownlow’s timeline. The episode expands this premise out into a worthwhile story about the perils of changing the future. After two good and worthwhile entries, The Crystal Egg is a lesser piece. It introduces a concept – a crystal egg that has the ability to act as a portal to Mars. The entire episode is spent in build up to revealing what the egg does and then once this is revealed it become in effect a horror story about shutting this off. The previous two episodes are conceptual puzzles but this is a Gothic story that holds the view that the rest of the universe is one of imminent threat. The story ends with a typical anthology just desserts ending for the greedy and avaricious. The episode does end with the suggestion that the Martians encountered are what inspired H.G. Wells to write The War of the Worlds (1898). The effects representing the emergence of the Martians look cheap. The Remarkable Case of Davidson’s Eyes has the same problems. It is based around a fantastical idea – an experimental side effect that causes a man’s sight to be displaced half the world away – but the story lacks a second act beyond the initial premise. There is nothing much to the episode after the discovery of what has happened. Most of the episode’s running time is spent on the comic runnings around the asylum trying to rescue Dominic Cooper and avoid his uncle, the pompous dean (Barry Stanton). It is another case of a slim story being padded out to one-hour length – by contrast, in the original 3000 word story, there are no scenes set in an asylum. The Truth About Pyecraft is the only one of the tales that sits as fantasy rather than science-fiction. (In the short story, the agency affecting Pyecraft’s weightlessness is a recipe from the narrator’s Hindu great-grandmother, while here it becomes a mysterious apothecary shop). When this becomes apparent, you see that the episode falls into a certain type of light fantasy storytelling – the cautionary tale based around the idea of the cursed wish that rebounds on the conferee due to the overly literal interpretation of the wording of the wish. It is more of a comedic episode than any of the others. Michael Fitzgerald gives an awfully fey performance as Pyecraft, although the episode does have an appealing emotional uplift that the two preceding episodes do not. It goes out on the charming image of Fitzgerald and his lady love (Catherine Bailey) dancing while floating in mid-air. The Stolen Bacillus starts out seeming like it is going to be a biowarfare thriller plot along the lines of something like The Satan Bug (1965). Doomsday Man (1998) or The Patriot (1998) about an individual or organisation who steals and threatens to release a deadly infection. This is the way the Wells story plays out, which is simply about an anarchist stealing a test tube of cholera and trying to infect as many as possible. At the outset, one thinks that The Stolen Bacillus seems a passe choice as an adaptation as the contagion/outbreak thriller is an old hat idea by now, even though it might have seemed a novel one to H.G. Wells back in 1894 when the concept of biowarfare did not exist. In recognition of this, the mini-series tries to pad the story out into something else and the latter half of the episode is about the socially devastating consequences of a truth-telling serum. This is not given enough time to be as interesting as it suggests and the episode peters out into another nothing much story. Nobody much in the cast has gone onto anything of note. The sole exception might be Dominic Cooper who plays the man with displaced sight in The Remarkable Case of Davidson’s Eyes who subsequently went onto roles in high profile films like Captain America: The First Avenger (2011) and Abraham Lincoln, Vampire Hunter (2012). The one interesting face present is that of Nicholas Rowe who has the role of the college’s absent-minded professor. It was nearly two decades since Rowe played the title role in Young Sherlock Holmes (1985) and seeing him with far more adult features here, not to mention cast in the role of a pompous bore, is a considerable surprise. (If British television ever needed anyone to cast in the role of Prince Charles, Nicholas Rowe has an uncanny resemblance that would be perfect for the part). Tom Ward plays the part of Wells with an undeniably dashing charm, even if the old age makeup that transforms him into the senior Wells is so-so. One of the weaker aspects of the production is the sets. These look and are shot as though they are standard period set-ups that have been wheeled out of the BBC costume drama warehouse and nothing changed since the 1970s. Similarly, the photography and lighting looks like faded videography from that era. The visual effects are cheaply passable for what is required. Hallmark Entertainment’s other works of genre note are:– the sf mini-series White Dwarf (1995), The Canterville Ghost (1996), Gulliver’s Travels (1996), Harvey (1996), the Christmas musical Mrs Santa Claus (1996), Murders in the Rue Morgue (1996), the children’s horror Shadow Zone: The Undead Express (1996), the medical thriller Terminal (1996), The Odyssey (1997), the cloning thriller The Third Twin (1997), 20,000 Leagues Under the Sea (1997), the monster movie Creature (1998), Merlin (1998), the sf film Virtual Obsession (1998), Aftershock: Earthquake in New York (1999), Alice in Wonderland (1999), Animal Farm (1999), A Christmas Carol (1999), the tv series Farscape (1999-2003), Journey to the Center of the Earth (1999), The Legend of Sleepy Hollow (1999), The Magical Land of the Leprechauns (1999), Arabian Nights (2000), the modernised Hamlet (2000), Jason and the Argonauts (2000), Prince Charming (2000), the mini-series The 10th Kingdom (2000) set in an alternate world where fairy-tales are true, the medical thriller Acceptable Risk (2001), Jack and the Beanstalk: The Real Story (2001), The Monkey King/The Lost Empire (2001), My Life as a Fairytale: Hans Christian Andersen (2001), Snow White (2001), the series Tales from the Neverending Story (2001), the fantasy adventure Voyage of the Unicorn (2001), the Sherlock Holmes film The Case of the Whitechapel Vampire (2002), Dinotopia (2002), The Hound of the Baskervilles (2002), the Christmas film Mr St. Nick (2002), the Christmas film Santa Jr (2002), Snow Queen (2002), the modernised A Carol Christmas (2003), Children of Dune (2003), the American Indian legends mini-series Dreamkeeper (2003), the children’s monster film Monster Makers (2003), Angel in the Family (2004), A Christmas Carol (2004), Earthsea (2004), 5ive Days to Midnight (2004) about forewarning of the future, Frankenstein (2004), King Solomon’s Mines (2004), the Christmas film Single Santa Seeks Mrs. Claus (2004), Dinotopia: Quest for the Ruby Sunstone (2005), Hercules (2005), the thriller Icon (2005), Meet the Santas (2005), Mysterious Island (2005), the disaster mini-series Supernova (2005), The Curse of King Tut’s Tomb (2006), the disaster mini-series The Final Days of Planet Earth (2006), Merlin’s Apprentice (2006), the bird flu disaster mini-series Pandemic (2006), the disaster mini-series 10:15 Apocalypse (2006), the psychic drama Carolina Moon (2007), the psychic drama Claire (2007) and the ghost story Something Beneath (2007).